Tank Man stories at Techdirt. stories filed under: "tank man"
So we've talked a lot about the Great Firewall of China and how it works. Contrary to what many believe, it's not just a giant government bureaucracy blacklisting content, but a huge ecosystem that partially relies on unpredictability and the lack of intermediary liability protections online. That is, rather than directly say "this and that are blocked," the Chinese government will often just let companies know when they've failed to properly block content and threaten them with serious consequences. Because of this, you get a culture of overblocking, to avoid running afoul of the demands. This is one of the reasons why we believe that strong intermediary liability protections are so important. Without them, you're basically begging for widespread censorship to avoid legal consequences. It appears that this is something of a reaction to the Chinese government announcing that it will be investigating Baidu's advertising practices, following the death of a young man from cancer, who had kicked up quite a lot of attention after he had tried an "experimental" cancer treatment he discovered via an ad on Baidu. When it didn't work, he blamed Baidu for allowing the ad, and when he passed away there was a public outcry. In response, the government announced plans to investigate Baidu's ad practices. 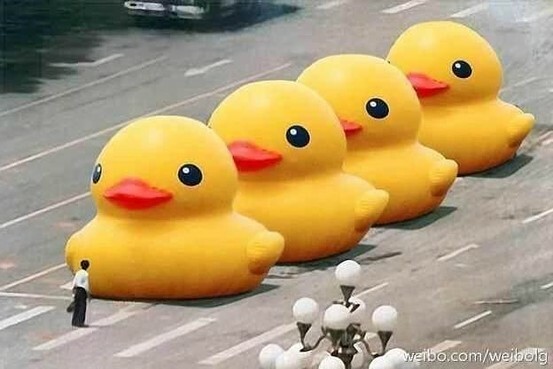 It appears that Baidu loosening the padlocks on Tiananmen Square might be a response to that, which lots of people seem to think is playing with a fire in a manner that will almost certainly leave the company burned. This is a direct & blatant refusal to play by the rules. Baidu has a lot of power behind the scenes, but even then, this looks like treason. This will probably end soon - hearing from friends in Beijing that some searches are censored again - but it will cause months of trouble. Young, educated Chinese are so used to cat and mouse censorship that when they see something like this, they screenshot immediately. At a conservative guess, there've been a billion screenshots taken of various banned images, jokes, and memes during the last day. Shirky has a lot more to say, including some further speculation that perhaps there was growing tension from last year, after the Chinese government basically made use of Baidu to fire a denial of service at GitHub. The fact that the packets came via Baidu was, as Shirky notes, a PR blackeye for Baidu at a time when the company wants to expand beyond China. Shirky also deleted a tweet that originally said "this has to backfire," noting how central media and internet censorship is to the current regime. The brief dropping of the censorship appears to be (again, Shirky notes no one knows for sure -- but many people seem to believe) Baidu trying to let the Chinese government know that it has become powerful enough to make trouble for the government, so it's not just a one way street in terms of who holds the power. Of course, that seems like an incredibly risky move to make if you really don't have enough power to stand up to the government. We may never know all the details of what's going on, but it's a brief, if fascinating, view into some of what's going on in China today with the Great Firewall, and the increasing power of some of its most successful companies. But it's also a reminder of why we should be so thankful for strong intermediary liability protections in the US, and how not having such protections is a sure path to censorship.